Hey everyone! I have been working feverishly on these layouts I'm doing for hire. This darling little girl graduates this year and her Grandma is wanting a scrapbook for her graduation celebration.I have been working on these a few months now and I have done MANY! I've lost track counting. Actually I'm working on layouts for albums for all of their grandkids. 9 Grandkids to be exact. I'll be busy for a while. It's fun to see the photos of the kids growing up and changing over the years. It makes me feel good to be a part of helping preserve these memories for them. I used the Fancy Pants Designs "Happy Place" Collection for this layout. I just can't say enough how much I love using Fancy Pants Products. They make pulling at layout together SO easy. Same with cards, or anything else you are wanting to create. There is always great pieces for titles, and so many fun bits and pieces for adding interest. It's been fun working on these layouts, because since there are so many to do, I have to keep them simple, so I can keep moving. Not sweating it and just kind of rolling with it has been nice. I've actually been pulling up sketches on Pinterest for quick inspiration and it has really helped me to keep trucking along. Many of the layout are about trying to get quite a few photos on to one pages, and doing two page spreads. That is a bit out of my comfort zone, so the sketches have been a big help. 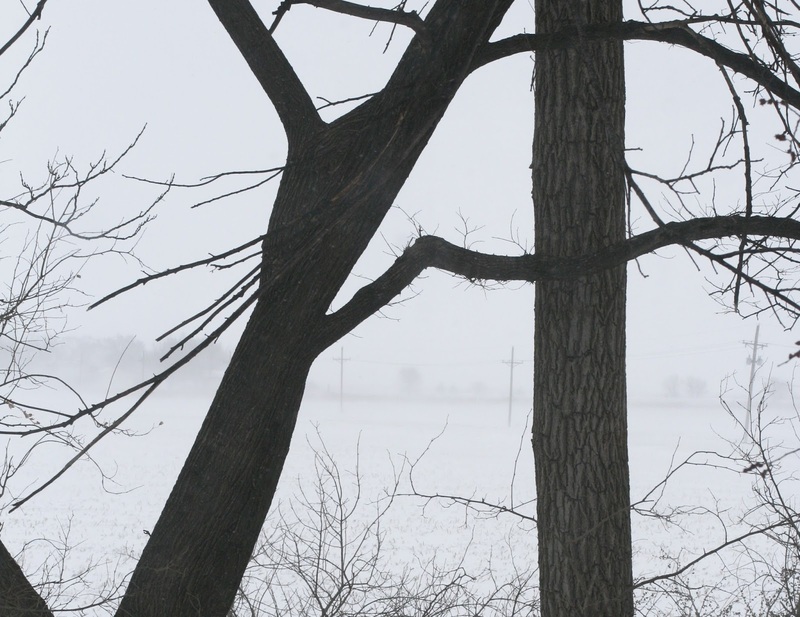 This photo is the view looking out from my studio window to the North. Faintly in the distance you can barely see the county road that runs along the East side of our property. I can hear the wind whipping out there, and I'm cold even in the house, so I have no intention of going out! So.. it's inside activities for me. Aside from working on the layouts , I decided to give a try, something that I have been watching You Tube videos about. They are taking these beads ( you can get at Hobby Lobby or Micheals), and melting them in the oven on Parchment paper, to create little dot embellishments that look just like the enamel dots you buy on sheets. I decided to give it a whirl. 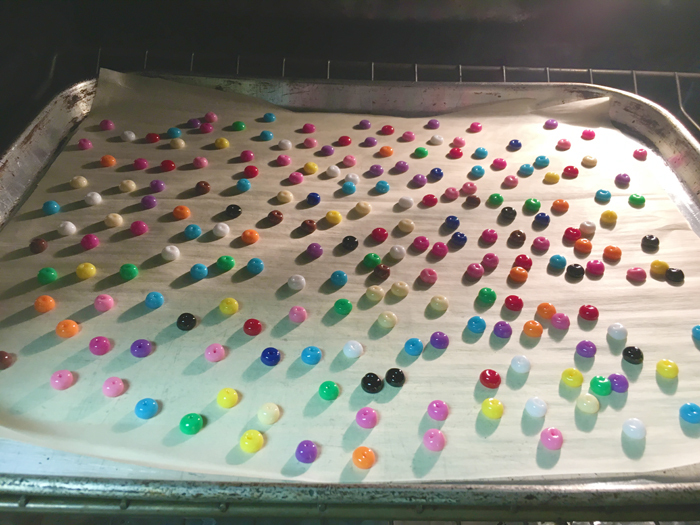 Below you can see how I have them laid out on parchment paper on a cookie sheet. ( I did hear in one of the videos that they used $ store parchment paper and it did not work as well as Reynolds brand). I used Reynold band parchment paper and it worked super. I did mine in the over at 425 for about 11 minutes. This will vary with size. That was for the larger ones. The smaller ones were about 6 minutes. Just watch them, and you can tell when they are ready. First they will start to look like little doughnuts and then closer to the end, you will only see a little dimple in the top. They are still not ready until that little dimple is gone. Below you can see were you can still see the little indentation where the hole was. They still need another minute or so. They cool quickly and come right off the parchment paper. I just folded the parchment when they were cooled and used it like a funnel to pour them right into the container. I heard in one of the videos I saw that she used the other type of beads. (Perler Beads) and cut them in half. That seemed a bit time consuming for me ,but I did find the Pony Beads in a smaller size also. 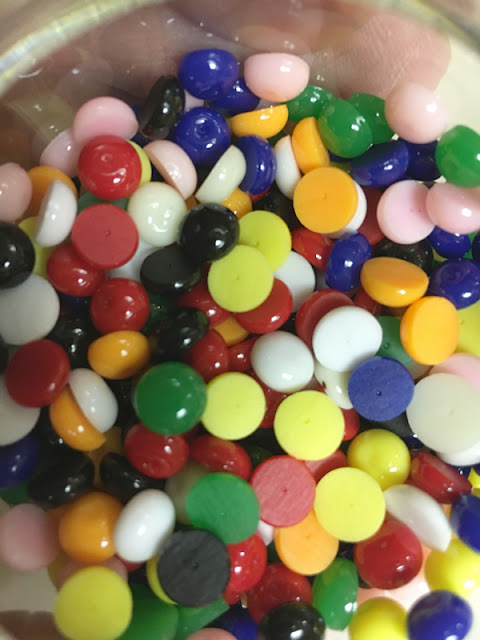 So be sure to look closely in bead isle because they may have a couple of different sizes. I found both sizes of these at Hobby Lobby. 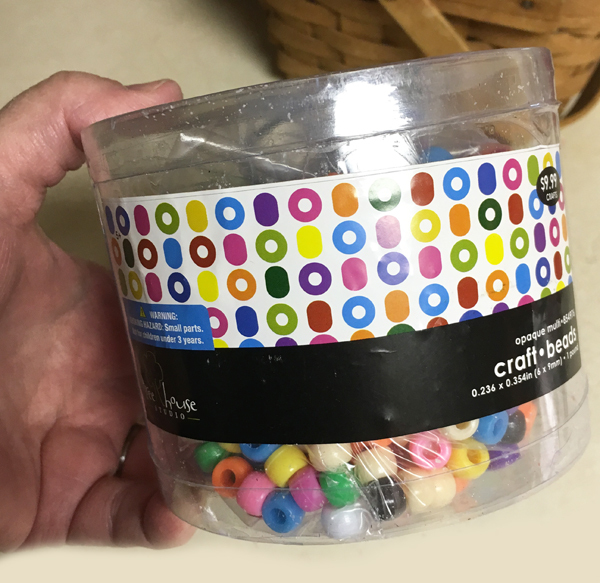 I only tried the Pony beads. And I have plenty of these now, so I don't think I'll be doing any others. I like how these turned out. 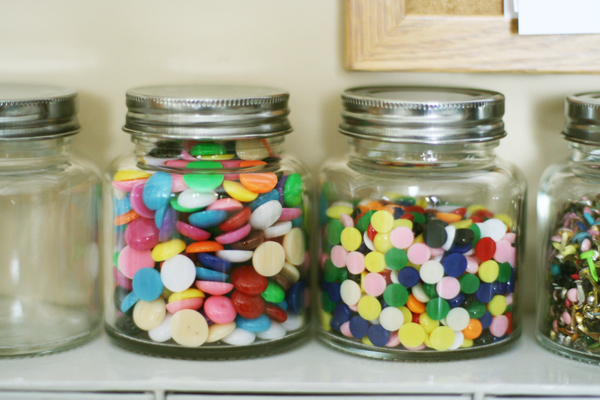 I have these two jars now and I haven't even used half of my container of beads. Just so you know... I did notice a bit of a smell from them being in the oven, but not a lot. With being a migraine sufferer I'm very conscious of smells and what might bother me and trigger a headache. I will wait for a nicer day when I can open the windows a bit for ventilation before a do more, just to be safe. Cracking the door open during a blizzard last night probably wasn't the best. lol But.. I sure didn't want a headache. Well, this is now the really cool part. I was thinking of away to get adhesive to the backs without having to use a drop of glue when I add them to a card or layout. This is one thing I didn't hear mentioned in any of the videos. I often have trouble adding a wet glue to an embellishment I'm putting on a project. Even tho I try to add just add a little, it seems to "smoosh" out around the edges. I don't like the glue mess on my project. 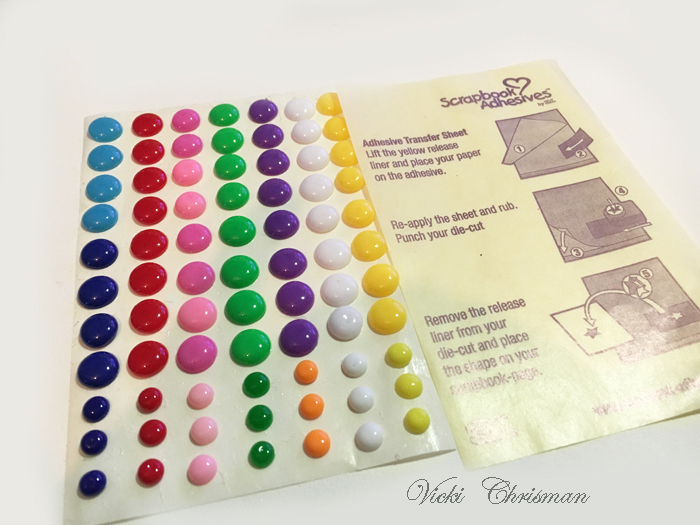 DODZ Adhesives Dots Small from Scrapbook Adhesives by 3 L would be a great solution to this. 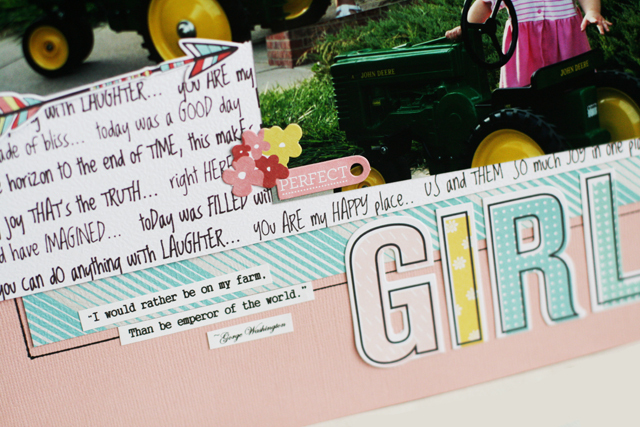 But Scrapbook Adhesives by 3L Adhesive Transfer Sheets came into my mind. I couldn't wait to give it a try. It worked GREAT! I just peeled off the top sheet and added the dots. SO easy! When I remove them from the sheets the adhesive is on the dots! 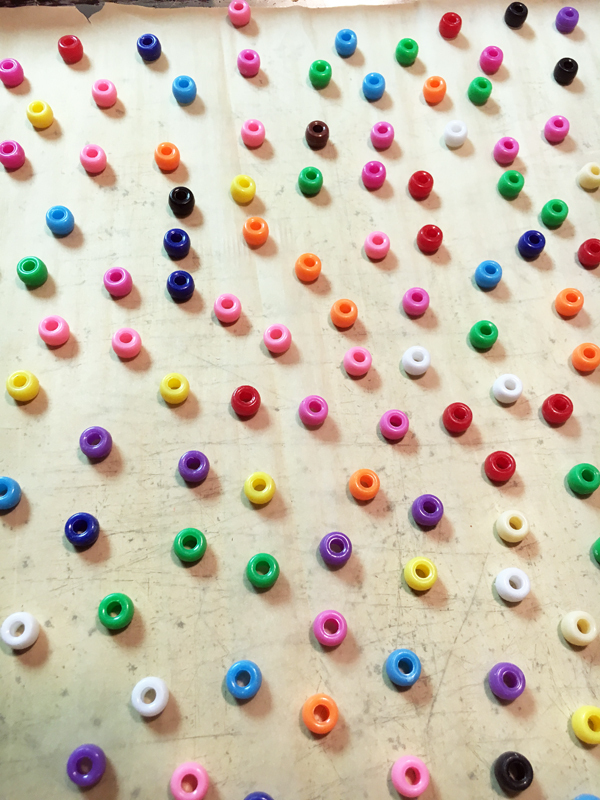 My dots are on a sheet and all ready to use!! Seriously it could got have worked any better! YAY! 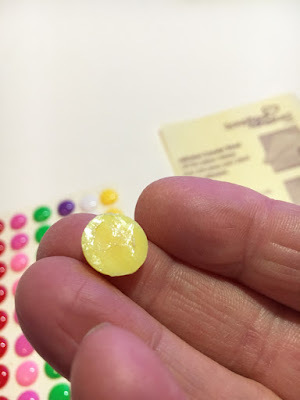 If you do make these easy dots, the adhesive sheets are a must. My online J Bloom Party is still doing on until Monday, if anyone is interested. Here is the link. Love that little girl and the layout you made is just perfect for her. What a Eureka idea to put the dots on the dots by 3L!! That is pure genius. Your weather sounds horrible! We have had near the hottest winter on record here. Yesterday we almost hit 80 and today we are in the 40's. Mother Nature is not happy with how we are caring for her earth! Hugs. Those dots are so cool! I use them alot (store-bought, not DIY) in my layouts. In fact, I just purchased a bunch of glittery ones! But now I know how to make my own! Ingenious! Thanks!!! 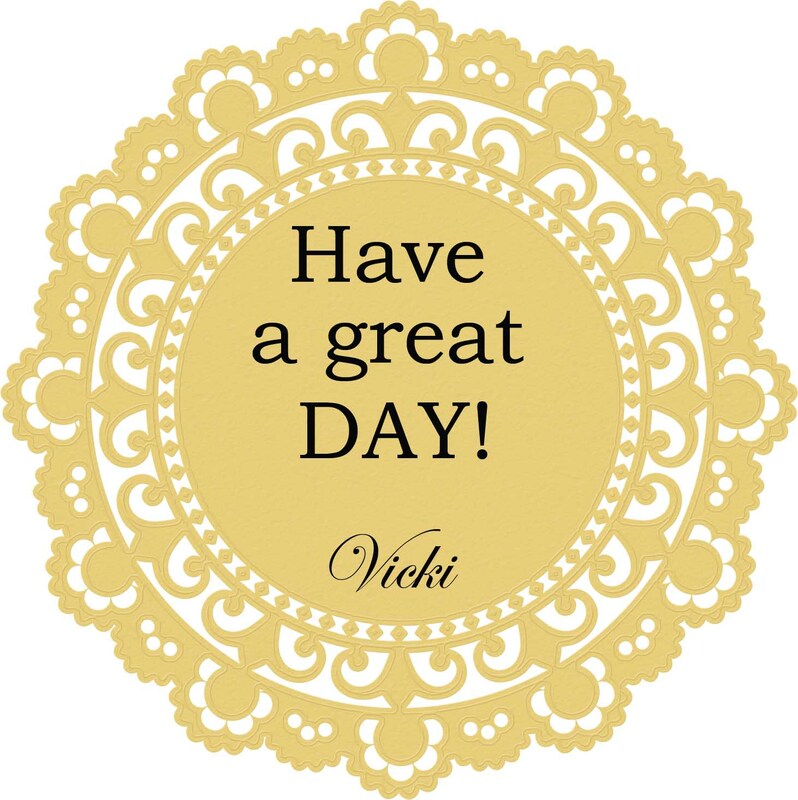 Awesome, Vicki! How cool is this? LOVE!!! Wonderful, wonderful, wonderful LO! What a darling that little girl is! 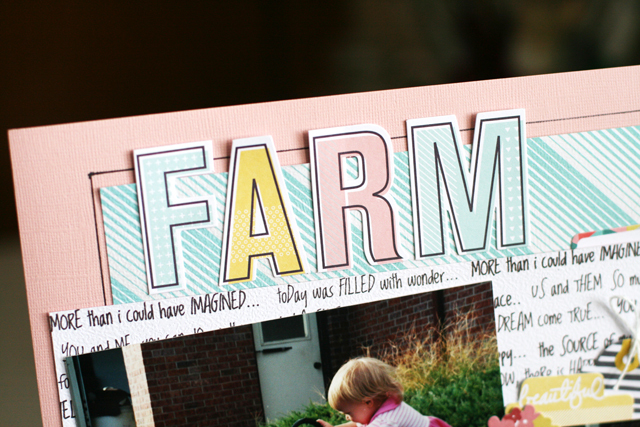 And-- love the farm theme done in pastels! 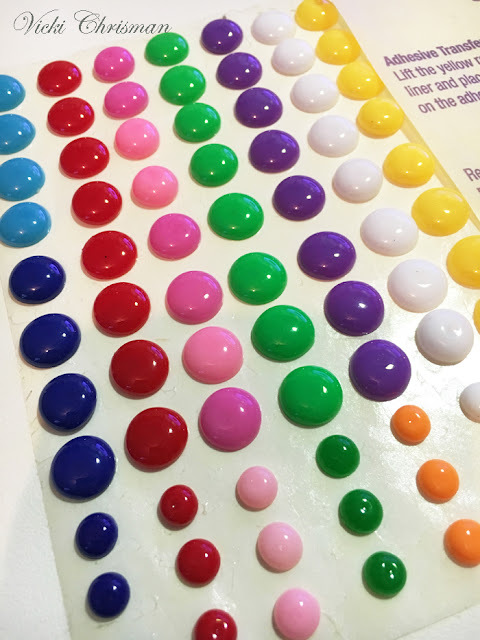 TY for the tips about the colourful dots. I love them too, and will need to try this. Will check out Pinterest. You rock. 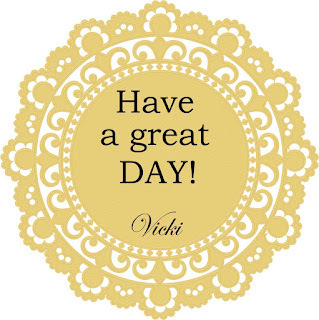 Just wanted to tell you that- time's been short, and I always check out your posts, but don't take the time to tell you that I did.. Keep up the great work Vicki! 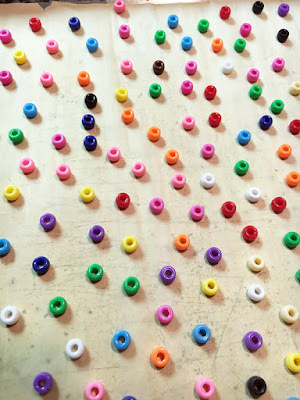 Awesome pony bead trick, Vicki!! 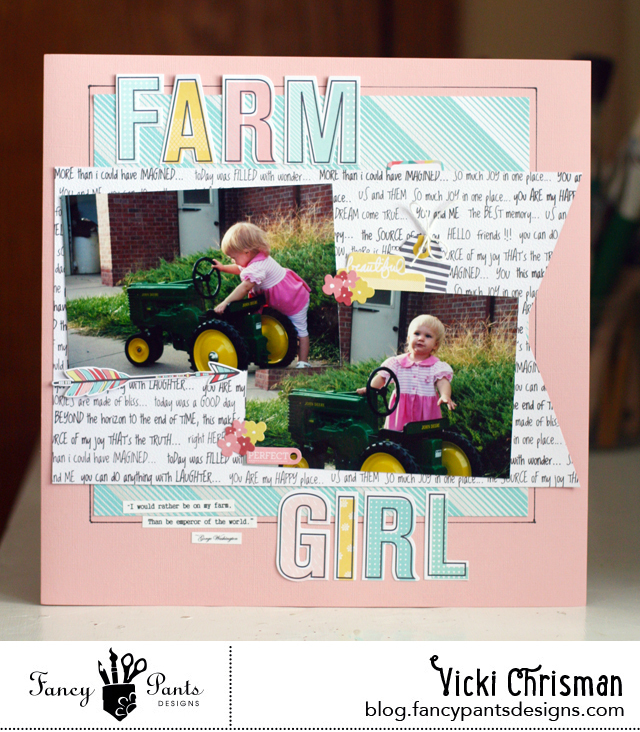 And the layout is adorable! Happy Valentines Day! It's a party! !